Julius Wilhelm Richard Dedekind (October 6, 1831 – February 12, 1916) was one of the major German mathematicians in the late nineteenth century who did important work in abstract algebra, algebraic number theory, and laid the foundations for the concept of the real numbers. He was one of the few mathematicians who understood the importance of set theory developed by Georg Cantor. Dedekind argued that the numbers system can be independently developed from geometrical notations and that they are grounded in and derived from a certain inherent creative capacity of the mind, which were some of those issues debated by Bolzano, Cantor, Frege, and Hilbert. Dedekind was the youngest of four children of Julius Levin Ulrich Dedekind. He was born, lived most of his life, and died in Braunschweig (often called "Brunswick" in English). In 1848, he entered the Collegium Carolinum in Braunschweig, where his father was an administrator, obtaining a solid grounding in mathematics. In 1850, he entered the University of Göttingen. 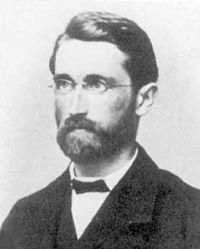 Dedekind studied number theory under Moritz Stern. Gauss was still teaching there, although mostly at an elementary level, and Dedekind became his last student. Dedekind received his doctorate in 1852, for a thesis titled Über die Theorie der Eulerschen Integrale ("On the Theory of Eulerian integrals"). This thesis did not reveal the talent evident on almost every page Dedekind later wrote. At that time, the University of Berlin, not Göttingen, was the leading center for mathematical research in Germany. Thus Dedekind went to Berlin for two years of study, where he and Riemann were contemporaries; they were both awarded the habilitation in 1854. Dedekind returned to Göttingen to teach as a Privatdozent, giving courses on probability and geometry. He studied for a while with Dirichlet, and they became close friends. Because of lingering weaknesses in his mathematical knowledge, he studied elliptic and abelian functions. Yet he was also the first at Göttingen to lecture on Galois theory. Around this time, he became one of the first to understand the fundamental importance of the notion of groups for algebra and arithmetic. In 1858, he began teaching at the Polytechnic in Zürich. When the Collegium Carolinum was upgraded to a Technische Hochschule (Institute of Technology) in 1862, Dedekind returned to his native Braunschweig, where he spent the rest of his life, teaching at the Institute. He retired in 1894, but did occasional teaching and continued to publish. He never married, instead living with his unmarried sister Julia. Dedekind was elected to the Academies of Berlin (1880) and Rome, and to the Paris Académie des Sciences (1900). He received honorary doctorates from the universities of Oslo, Zurich, and Braunschweig. He died on February 12, 1916, aged 84. While teaching calculus for the first time at the ETH Zürich Polytechnic, Dedekind came up with the notion now called a "Dedekind cut" (in German: Schnitt), now a standard definition of the real numbers. The basic idea behind this notion is that an irrational number divides the rational numbers into two classes, with all the members of one class (upper) being strictly greater than all the members of the other (lower) class. For example, the square root of 2 puts all the negative numbers and the numbers whose squares are less than 2 into the lower class, and the positive numbers whose squares are greater than 2 into the upper class. Based on this idea, Dedekind cuts are defined as pairs of such divided classes of rational numbers. Wherever a cut occurs and it is not on a real rational number, an irrational number (which is also a real number) is created by the mathematician. This means that every location on the number line continuum contains either a rational or an irrational number. Thus, the Dedekind cuts are considered real numbers. There are no empty locations, gaps, or discontinuities. Dedekind published his thought on irrational numbers and Dedekind cuts in his paper Stetigkeit und irrationale Zahlen ("Continuity and irrational numbers." Ewald 1996: 766. Note that Dedekind's terminology is old-fashioned: in the present context, one now says Vollständigkeit instead of Stetigkeit, so a modern translation would have continuity replaced with completeness). In 1874, while on holiday in Interlaken, Dedekind met Georg Cantor. Thus began an enduring relationship of mutual respect, and Dedekind became one of the very first mathematicians to admire Cantor's work on infinite sets, proving a valued ally in Cantor's battles with Leopold Kronecker, who was philosophically opposed to Cantor's transfinite numbers. The 1879 and 1894 editions of the Vorlesungen included supplements introducing the notion of an ideal fundamental to ring theory. (The word "Ring," introduced later by David Hilbert, does not appear in Dedekind's work.) Dedekind defined a ring ideal as a subset of a set of numbers, composed of algebraic integers that satisfy polynomial equations with integer coefficients. The concept underwent further development in the hands of Hilbert and, especially, of Emmy Noether. Ideals generalize Ernst Eduard Kummer's ideal numbers, devised as part of Kummer's 1843 attempt to prove Fermat's last theorem. (Thus Dedekind can be said to have been Kummer's most important disciple.) In an 1882 article, Dedekind and Heinrich Martin Weber applied ideals to Riemann surfaces, giving an algebraic proof of the Riemann-Roch theorem. Dedekind made other contributions to algebra. For instance, around 1900, he wrote the first papers on modular lattices. In 1888, he published a short monograph titled Was sind und was sollen die Zahlen? ("What are numbers and what should they be?" [Ewald 1996: 790]), which included his definition of an infinite set. He also proposed an axiomatic foundation for the natural numbers, whose primitive notions were one and the successor function. The following year, Giuseppe Peano, citing Dedekind, formulated an equivalent but simpler set of axioms, now the standard ones. ↑ Richard Dedekind. Stetigkeit und irrationale Zahlen. Retrieved January 22, 2011. 1963. Essays on the Theory of Numbers. Beman, W. W., ed. and trans. Dover Publications. ISBN 0486210103. Contains English translations of Stetigkeit und irrationale Zahlen and Was sind und was sollen die Zahlen? 1996. Theory of Algebraic Integers. Stillwell, John, ed. and trans. Cambridge University Press. ISBN 0521565189. A translation of Über die Theorie der ganzen algebraischen Zahlen. 1854. "On the introduction of new functions in mathematics," 754-61. 1872-82, 1899. Correspondence with Cantor, 843-77, 930-40. Edwards, H. M. 1983. "Dedekind's invention of ideals," Bull. London Math. Soc. 15: 8-17. All links retrieved July 27, 2013. John J. O'Connor and Edmund F. Robertson. Richard Dedekind at the MacTutor archive. Richard Dedekind at the Mathematics Genealogy Project. Essays on the Theory of Numbers (English) Project Gutenberg. The Early Development of Set Theory Stanford Encyclopedia of Philosophy. This page was last modified on 27 July 2013, at 23:13.